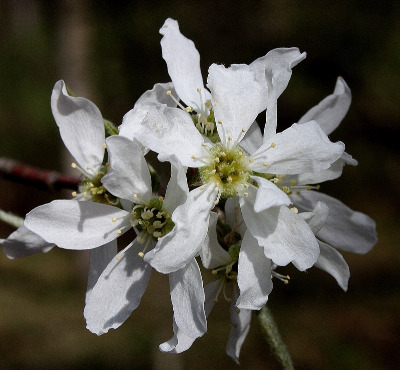 Often a tall, clumped shrub, typical of sandy open savanna and dunes (oak, jack pine, aspen), shallow soil on rock outcrops, shores; less often in or at borders of hardwoods and conifer swamps or in other wetlands. Here treated as a complex of uncertain origin, characterized by finely toothed acute to short-acuminate leaves. The commonest and most easily recognized expression has leaves nearly glabrous (or soon glabrate) and bronze-red at anthesis, similar to A. laevis but the summit of the ovary densely to sparsely tomentose. There is gradation, however, to plants with some tomentum on at least young leaves and this may persist on petioles or midribs. The suggestion that A. interior represents a hybrid swarm involving A. laevis (or sometimes A. arborea) and plants of the A. spicata and/or A. sanguinea complexes has been made and is a likely explanation for the range of plants included here. Plants with veins extending clearly into the leaf teeth suggest A. sanguinea as a parent; those with ± tomentose young leaves suggest that A. arborea rather than A. laevis could be a parent (though such a character could come from either A. sanguinea or A. spicata). MICHIGAN FLORA ONLINE. A. A. Reznicek, E. G. Voss, & B. S. Walters. February 2011. University of Michigan. Web. 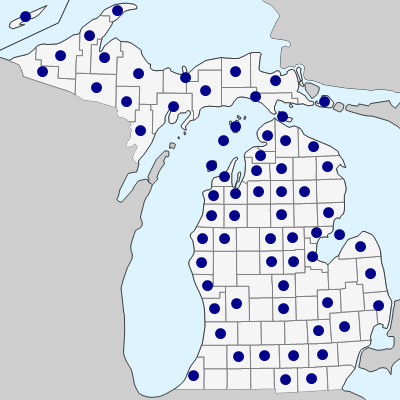 April 24, 2019. https://michiganflora.net/species.aspx?id=2423.